Sample is 3/4-by-3-inch beveled-edge solid strip. Color: In yellow birch (B. alleghaniensis), sapwood is creamy yellow pale while; heartwood is light reddish brown tinged with red. In sweet birth (B. lenta), sapwood is light colored and heartwood is dark brown tinged with red. Variations Within Species And Grades: Yellow birch, sweet birch, paper birch. Paper birch (B. papyrifera) is softer and lower in weight and strength than yellow or sweet birch. 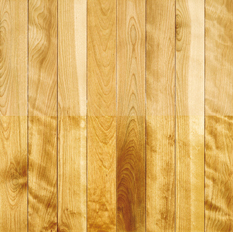 However, yellow birch is most commonly used for flooring. Boards can vary greatly in grain and color. Hardness/Janka: 1260 (yellow); 2% softer than Northern red oak. Dimensional Stability: Average (change coefficient .00338; 8% more stable than red oak). Durability: Hard and stiff; very strong, with excellent shock resistance.